This project is supported by competitiveness clusters Trimatec, Pôle MER PACA, DERBI, CapEnergies and is led by the GDF-Suez Group pioneering wind energy company "La Compagnie du vent". Proposals were submitted for FUI (single interministerial fund) funding on 29 November 2009, and a favorable opinion was given in January 2010. The validation procedure led to formal approval by the DGSIS in March 2010. The importance of mobilizing new sources of bioenergy and bioproducts is proving critical in the context of the global initiative to reduce greenhouse gas emissions. It is in this context that interest in the humid coastal zones in the South of France is growing, as their ecosystems are particularly conducive to algoculture development. Here we find large areas available for cultivation, and significant opportunities in a region where there is already a need to diversify existing business activity linked to salt marshes in the South, a local industrial infrastructure (Fos-sur-Mer) source of large amounts of CO2 and the natural presence of a microalgae with significant added value potential, Dunaliella salina. 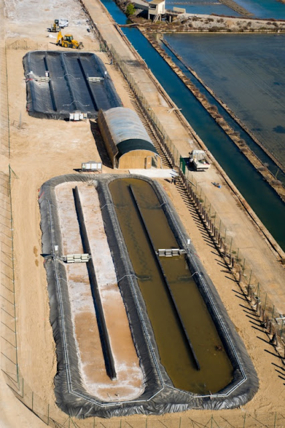 Taking this favorable environment as starting point, the SALINALGUE project aims to cultivate Dunaliella salina on a large scale in an open environment on unexploited salt marshes, and then process or ‘biorefine’ it to yield various bioproducts: biodiesel, biogas, molecules with high added value (Beta-carotene, Omega 3…), and proteins for aquaculture feed. The project sets out to understand and control cultivation and harvesting of this native microalgae with a view to developing the biorefining processes that will enable its exploitation on an industrial scale. Studying and experimenting with the extraction of the various compounds making up the microalgae will enable valorization of the whole of the biomass produced. Finally, trialing on a demonstration scale (over 10 hectares) will be conducted to validate the feasibility of the pre-industrial production chain from a technical-economic point of view. To ensure industrial and environmental success in creating this new market segment, SALINALGUE will draw on several key strategic notions: the biomediation of industrial CO2, innovative breakthroughs with respect to the main barriers to progress, a consortium of excellence, minimizing environmental impacts (ACV) and finally an objective for economic equilibrium for the field: lowest possible production cost (open tanks) and complete valorization of Dunaliella salina (with the biorefinery concept). Environmental, economic and social sustainability are the three fundamental notions underpinning the SALINALGUE project. The program content coincides exactly with the areas of competence offered by the PBA laboratory, making Ifremer the ideal SALINALGUE partner, and ensuring the laboratory’s know-how will be validated and complemented in the area of extensive culture. The laboratory will handle all aspects of biological culture for the operation. Leader: La compagnie du Vent, GDF-Suez group.